Subhash Photos the leading name in photography has arranged for free work shop on basics of digital cameras. In this digital age the use, availability and ease of use of a digital camera has increased multi fold. The prices of digital cameras have also fallen by which it is now in the common mans reach. Digital cameras have helped you in making you a better photographer and person. But enhancing the skills is important. 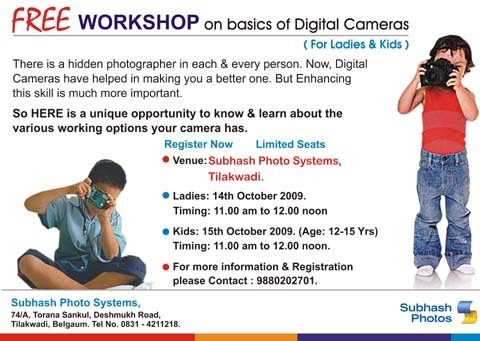 And for this reason Subhash Photos Tilakwadi has organized a free work shop for ladies and kids. Timing: 11 am to 12 noon. For more information and registration please contact: 9880202701.